Hardcover, 9.5 x 9.5 in. / 112 pgs / 50 color. Edited with text by Stuart Horodner, Janie M. Welker. Text by Roger Ballen, Julian Cox, Emmet Gowin, Marvin Heiferman, Corey Keller, Judy Linn, Christopher Meatyard, Duane Michals, Andrea Modica, Laurel Nakadate, Catherine Opie. 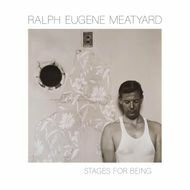 Stages for Being examines the photography that Ralph Eugene Meatyard created in and around Lexington, Kentucky, where he found abandoned houses in the countryside to use as sets, and directed friends and family members in scenes that suggest both ritual and theater. Establishing mood with natural lighting, he used masks, dolls and found objects as unsettling props and mined architectural detail for abstract compositional elements. Meatyard culled inspiration from a wide variety of sources. An autodidact in areas as diverse as jazz, painting, literature, history and Zen Buddhism, his voracious reading sparked endless ideas for his carefully constructed photographs. His process was also informed by consistent dialogue with a robust group of Kentucky peers, including the writer, environmental activist and farmer Wendell Berry; photographers Van Deren Coke and Robert C. May; the Trappist monk Thomas Merton; the painter Frederic Thursz; and the writer, poet and philosopher Guy Davenport, all of whom worked in the region but were engaged with contemporary ideas and practice in their fields. Ralph Eugene Meatyard (1925–72) attended Williams College as part of the Navy's V12 program in World War II. Following the war, he married, became a licensed optician and moved to Lexington, Kentucky. When the first of his three children was born, Meatyard bought a camera to make pictures of the baby. Photography quickly became a consuming interest. He joined the Lexington Camera Club, where he met Van Deren Coke, under whose encouragement he soon developed into a powerfully original photographer. Meatyard's work is housed at the Museum of Modern Art, George Eastman House in Rochester, New York, the Smithsonian Institution and many other important collections. Meatyard’s use of masks, shadows, abandoned houses, and figures in motion open up a deep and multi-layered place of feeling that we have yet to fully address. 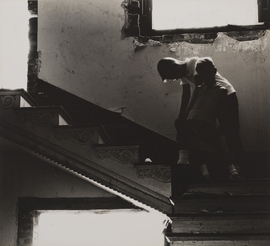 "Untitled" (circa 1971) is reproduced from Ralph Eugene Meatyard: Stages for Being, the new release from University of Kentucky Art Museum, which hosted the corresponding exhibition through December of 2018. 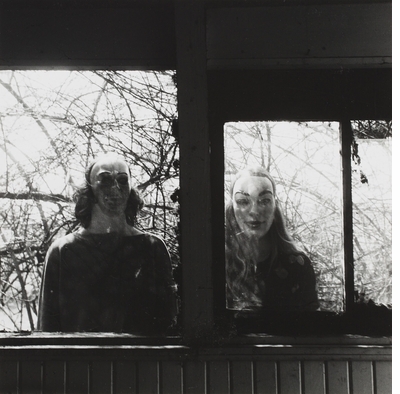 "There are some people who live lives as facts, and others who live lives as fiction," Duane Michals writes. Meatyard "was a Foto Voyant, a photographer whose imagination floated through the air like a cooling zephyr on a hot August afternoon in Kentucky. Beads of perspiration became pearls on his forehead. A reflection in a window revealed an entire galaxy of romantic whims. He didn't look to see, he saw to feel. Shadows were his reality… It is no surprise that an optician would be a seer." FORMAT: Hbk, 9.5 x 9.5 in. / 112 pgs / 50 color. Published by University of Kentucky Art Museum.